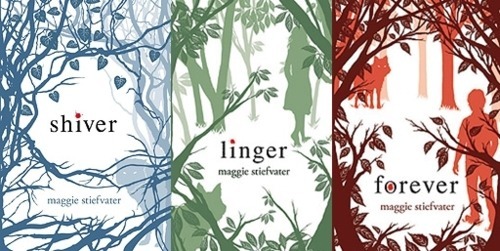 Maggie Steifvater is a New York Times bestselling author living in Virginia. Her works include the Books of Faerie novels, the Wolves of Mercy Falls series and the upcoming novel The Scorpio Races. Maggie is an award winning artist, plays several instruments, and has sold the rights to her novel, Shiver, in thirty-five foreign languages. The books in her Wolves of Mercy Falls series are Shiver, Linger and Forever. Grace. Who feels a connection with the wolves living in the woods behind her house. One wolf in particular – a yellow-eyed wolf, holds her attention. She meets a yellow-eyed boy who reminds her powerfully of her wolf, and is convinced they are one and the same. Sam. For whom winters mean frozen woods and adventures with the wolf pack, and summers are precious months of holding a human form. As the weather gets colder, Sam must fight his transformation, lest he stay a wolf forever. The quality of the story-telling in this trilogy is amazing. Steifvater’s writing style will captivate readers from page one and can be described as ‘lyrical’ since the words literally flow off the pages. The characters are well written and allow the author to evoke raw emotion in a powerful way, using a small cast to explore the changing relationship between parents and their almost-adult children, love and death. The ‘voice’ of Sam is my favourite aspect of the trilogy – he has a unique outlook on the world since he is only human for a few months, and the chapters narrated by him hold a lot of insight into his fellow human beings. His passages are brilliantly offset by those of Isabel and Cole, who look at the world through cynical eyes. Sam’s journey throughout the trilogy held my attention the most as it describes the struggle of a man who is granted his most desperate wish, and now waits in fear for it to be taken away. This is a beautiful trilogy which should be read for the writing quality alone. The subject matter makes it perfect for lovers of YA fiction and romance, and the well written prose would appeal to those who enjoy poetry.